We have been doing posts on classic dishes – French, Italian and American. But, what does that mean? What is the definition of a classic dish? I think there are a number of criteria – first, it has to be a dish that is widely known or, at the least, widely known in a certain region; secondly, while the dish might have some ancestors in other countries, it must have its own distinctive personality; and, thirdly, there have to be tons of different recipe variations showing that people have been experimenting for a long time. One of my friends has trouble understanding these things without a more down to earth example – like Marilyn Monroe and Bridget Bardot. Both of these dishes are widely known, each has a distinct personality and many have tried to copy or emulate them. Marilyn is classic American; Bridget is classic French. 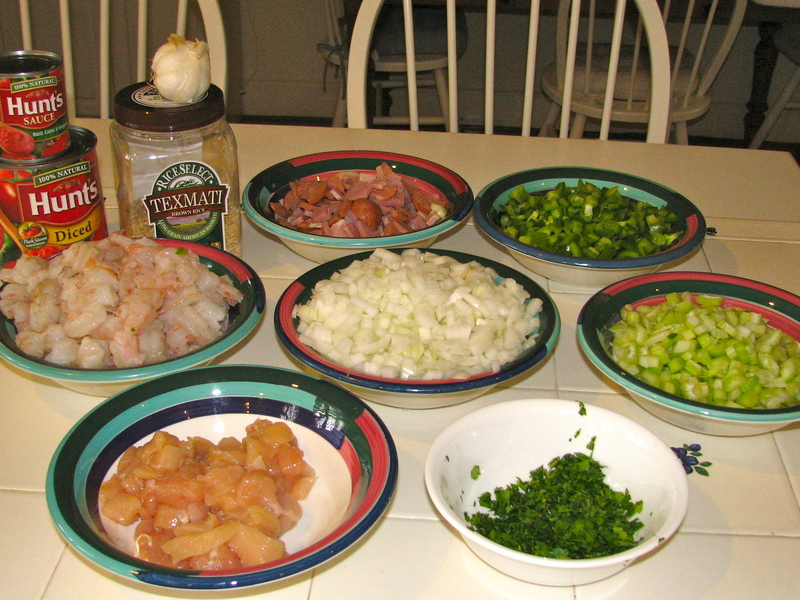 Jambalaya certainly qualifies as an American classic – it is widely known, especially in the South. 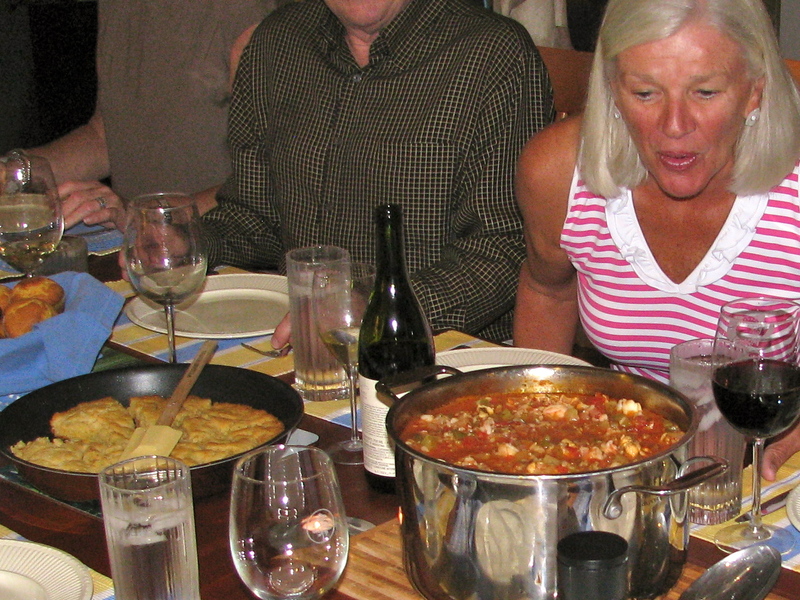 It may have some ancestors like Paella or Bouillabaisse, but they are not Jambalaya. If you wander around Europe trying to find a restaurant that serves Jambalaya, you will probably starve – it’s an American classic. Finally, there are scads of recipes for the dish. 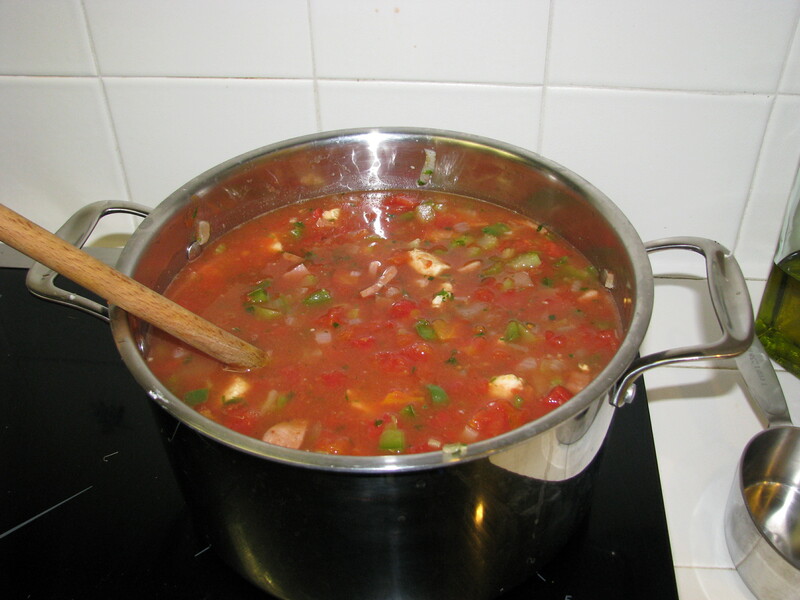 There are two main types of Jambalaya – with tomatoes and without. We prefer the dish with tomatoes. The recipe below is based on suggestions from Epicurious. (This is a great website and YouTube video series that you should try.) We changed the recipe in a couple of ways. First, we added Andouille sausage, which appears in many recipes, but not theirs. This spicy sausage is the epitome of Cajun and needs to be there. Secondly, and this is the great Bravado “value add”, we serve it with skillet cornbread. Jambalaya tends to be a little soupy and the cornbread works perfectly to sop up the juices and create a taste delight. Since Bravado Cooking is the first one to come up with this fantastic idea, we will probably be given prizes and awards of some type. 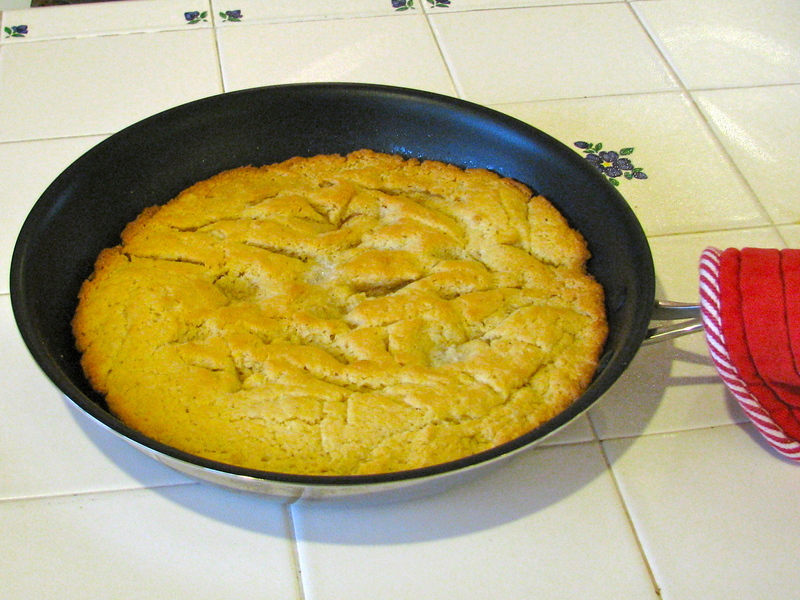 We will do a post next week on skillet cornbread. This recipe is not difficult to make, but preparation time is relatively long, so make sure you get started with that early enough. Some background music and a little wine helps. The actual cooking is simple and that is why this is such a great party dish. Sauté the veggies, add the rest of the ingredients and let it simmer for about 45 minutes. That can be going on when your guests arrive. Add the shrimp at the last minute and let everyone see how quickly they turn from grey to pinkish white color. This is a stovetop dish, so the oven is free for some skillet cornbread. Take the skillet with the cornbread and the pot of Jambalaya directly to the table and the crowd will go wild. 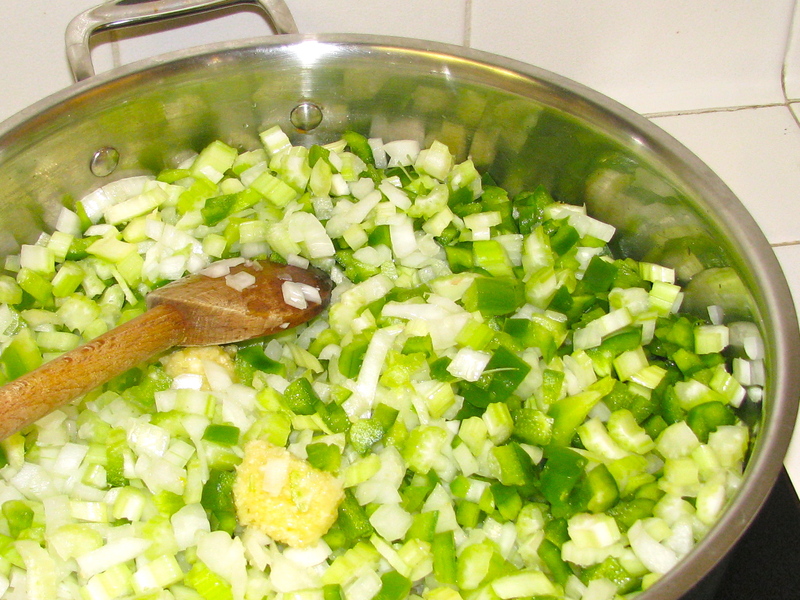 Heat the olive oil over medium/high heat and sauté the onion, green pepper, celery and garlic for about 7-8 minutes until the onion is translucent. Add the parsley, sausage, ham and chicken and cook for another 5 minutes. Add the bay leaves, cayenne pepper, tomatoes, tomato sauce, chicken broth and brown rice. Stir well and bring to a slow simmer. Cook covered for 40 minutes, checking frequently to maintain the simmer. Add the shrimp and cook uncovered for another five minutes. Add the salt and pepper, let cool and serve. You can serve this dish alone with some crusty bread; you can also make additional brown rice or orzo, or, best of all, you can serve with a hot skillet cornbread.